A crew works on a pipe casing on a Signal Hill Petroleum rig in Signal Hill, Calif., on Oct. 12. The number of oil rigs in production in the U.S. has reached a 24-year high, according to oil field services company Baker Hughes. In 2005, domestic production was 1.89 billion barrels. This year, experts say, production is expected to surpass 2 billion barrels. LOS ANGELES – In a downtown Los Angeles skyscraper, Hal Washburn is drilling for oil. Using a black high-definition computer screen, the petroleum engineer traces the ghostly white outlines of century-old vertical oil wells punctuated by the bright green and red of more recent efforts. The newer wells flare with what look like thousands of tiny hairs; the hotter the color, the greater the amount of oil. “Today, we drill a lot of wells on the computer before we drill underground,” said Washburn, chief executive of BreitBurn Energy Partners. The new crude being tapped – on screen and in real life – comes from Santa Barbara County’s Orcutt oil field, one of the state’s oldest, previously thought to be in terminal decline. “It’s been a huge home run for us,” Washburn said. Domestic energy producers like BreitBurn have helped to reverse the nation’s once-escalating dependence on foreign oil by finding new ways to figure out the secrets buried beneath our feet. U.S. net petroleum imports have fallen to about 47 percent of the nation’s consumption, down from a record 60.3 percent in 2005, Energy Information Administration statistics show. It’s been 15 years since the nation’s reliance on foreign oil has been this low. Several factors figure into the import decline, but a big one is a little surprising: U.S. petroleum exploration is experiencing a quiet renaissance with the help of technology and new drilling techniques. In 1901, wildcatters found “brown shale,” a sign that oil was present in exploitable quantities. But they bypassed that shallow layer and went straight down; various operators eventually drilled nearly 2,000 vertical wells that averaged about 3,000 feet in depth. BreitBurn acquired the field in 2004 and determined that the shallow layer of diatomite – a very porous, lightweight rock – contained more oil than any other part of the formation. 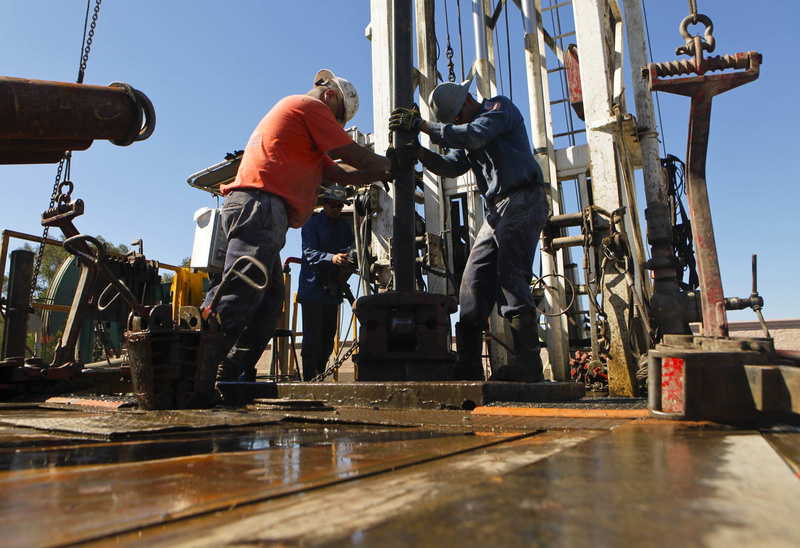 Monthly oil production at Orcutt has climbed to nearly 90,000 barrels from 50,000 barrels. In Santa Fe Springs, another BreitBurn oil field is delivering about 2,000 barrels a day rather than the 700 barrels a day it would have using old vertical well techniques. The gains have come from offset angle drilling, where the wells are dug at angles between 45 degrees and 80 degrees, into areas between old vertical wells where crude still remains, said Chuck Hawkins, BreitBurn’s project manager. BreitBurn isn’t the only California oil company looking to reverse California’s long decline in oil production. In the past five years, privately held Signal Hill Petroleum has buried 6,000 small yellow canisters around Long Beach and Signal Hill that contain sophisticated equipment so sensitive it can record the vibrations of a person walking past. The devices work in tandem with the company’s fleet of “vibroseis” trucks, 68,000-pound vehicles that use hydraulics to bounce. The bouncing trucks produce vibrations that create images of formations as far as 3 miles underground, said Dave Slater, chief operating officer for Signal Hill Petroleum. Slater says his small, 110-employee company and a subsidiary, the 70-employee Nodal Seismic, have sunk “tens of millions of dollars” into the effort. The leading edge of the production boom has come in parts of Texas, such as the Eagle Ford shale formation and the Permian Basin, as well as the Bakken formation, a huge reservoir under parts of North Dakota, South Dakota, Montana and Saskatchewan, said Fadel Gheit, senior energy analyst for Oppenheimer & Co. Gheit added that much of the work is from smaller oil companies that few people are familiar with.